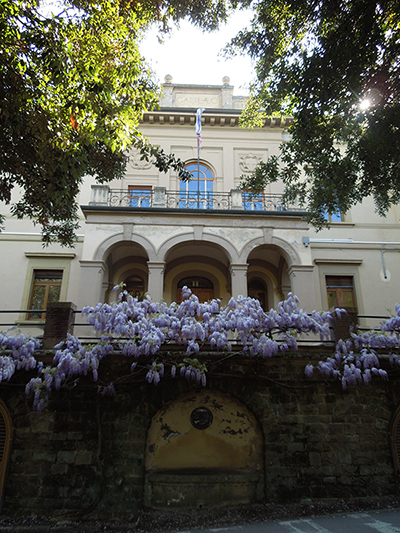 QSTAR is located in the headquarters of the old Institute of Physics, which hosts nowadays the Department of Physics and Astronomy of the University of Florence. The building was built in 1921 thanks to Antonio Garbasso. 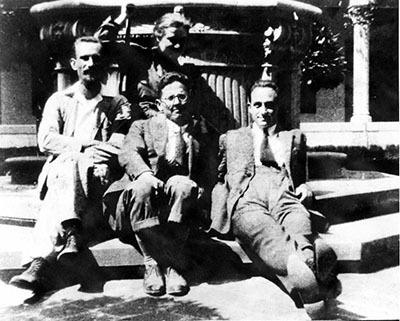 A group of brilliant physicists such as Gilberto Bernardini, Enrico Fermi, Joseph Loupe, Giulio Racah, Franco Rasetti and Bruno Rossi worked there and it was in that place that Enrico Fermi wrote his fundamental work on the statistics of the electrons in 1926. Enrico Fermi in the courtyard of "Garbasso"
This building, usually called "Garbasso", is one of the main buildings located on the hill of Arcetri, which has recently been celebrated as a historic site by the European Physical Society (EPS), as it is rich in historical and scientific interest. Going up the hill you will see also the National Institute of Optics, founded in 1927 by Vasco Ronchi, protagonist of the rebirth of optics in Italy, and the Arcetri Astrophysical Observatory, built in 1872 on the initiative of Giovan Battista Amici and Giovan Battista Donati. Higher up, on the edge of the area, there is "The Jewel", a Villa where Galileo spent the last years of his life (1631-1642). There Galileo completed the writing of the fundamental work “Dialogues of the New Sciences” (1638).